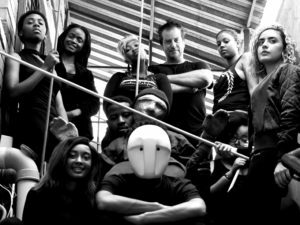 Cast & crew of Lebitso (‘Name’) by AFDA Johannesburg students. Image supplied. Lebitso is experimental, non-linear, a bit wild and it’s well refreshing to see young theatre-makers (students of AFDA Johannesburg) stepping out to create something that likely won’t go down as a crowd pleaser with the general public. Suspended from the roof, and semi-circling the stage are metre-wide strips of long brown paper gathered in a pile on the ground. These are played with, transformed into props, dragged hither and thither across the stage, are used to create some kind of netherworld… it’s a visual spectacle and the cast doesn’t allow this prominent feature to be mere backdrop. I reckon most significantly, these long, brown, imposing strips evoke tendril-like imagery. And given the thematic exploration of where one comes from and what makes one who one is; this backdrop becomes heavy deep-digging roots. Our roots, our heritage, given such importance in defining identity. Lebitso takes a shovel and trowel to this idea, attempting to unearth the complexities of identity and finding belonging in this mad world. Each performer bristles with passion and intensity. It’s not easy to hold an audience in this kind of work that rejects a linear exposition and, quite frankly, is quite weird. But these performers somehow create access for us… and so we do care about young Lebitso’s journey to discover what identity means to him. Some issues. The ‘atmospheric’ singing: it wasn’t clear if it was meant to be discordant or if the disharmony was in error. The paper: at times the rustling brown paper overrides the voices and we lose some lines – the performers are projecting and have powerful voices… but that paper is loud. But I’m happy I experienced it, and I’m happy that the future of theatre-making and visual theatre is in these hands. They’re courageous and determined and contributing to the art of theatre. Lebitso (‘Name’) has one last show today (30.06) at 12.30. Click here for more information, to book or tickets at the door.